Although skies were grey and ominous, hearts were full as many gathered at Akron Children’s Hospital for the Hope Lights the Way event to remember, honor and celebrate those affected by cancer. 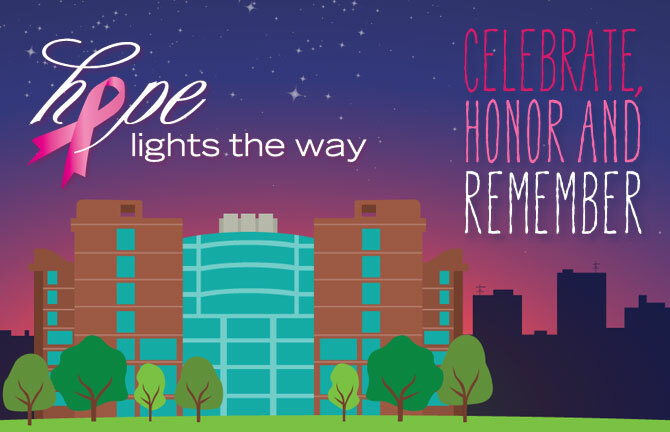 Hope Lights the Way, now in its 10th year, is typically held the first Tuesday in October, in parallel with breast cancer awareness month. However, the event draws and supports members of the community impacted by all types of cancer. Unfortunately, the rainy weather pushed Tuesday’s event indoors. In years past, the courtyard at the Considine Professional building (on the hospital campus) hosted dancers, musicians, speakers and families eager to reunite with the close-knit community of supporters. But the raindrops didn’t stop people from attending (thankfully!) and the evening commenced as scheduled, just in a different location. Luminaries were lit and beautiful words of remembrance were spoken and sung. Dr. Sarah Friebert told an inspiring personal story about her diagnosis that happened to fall on September 11th and the ‘spark’ that allows her to reflect and move forward in healing. The evening concluded with a beautiful acoustic, Irish song performed by renowned singer Irene Uhalley. Check out our blog post from last October to see imagery and read a bit more about Array’s continued involvement and support for the event (and little did we know, the ACH committee had a surprise in store for us! ): www.arraycreative.com/let-hope-light-the-way.